I returned yesterday from the 2011 World of Pinot Noir in Shell Beach, California, flush with fond memories of the cornucopia of spectacular Pinot Noirs and a renewed admiration for those that craft these marvelous grape concoctions. There were well over 225 wineries in attendance, offering wines to attendees at seminars and walk-around tastings Friday, Saturday and Sunday, March 4, 5 and 6. 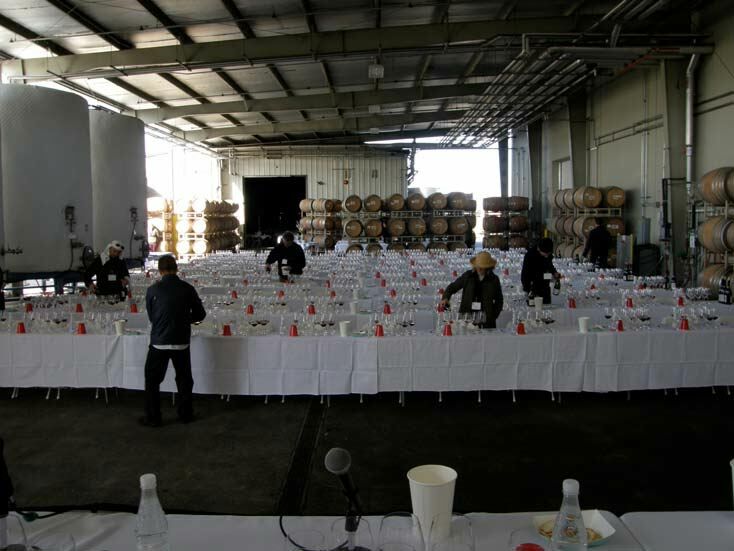 If one was up to the Herculean task, at least 600 Pinot Noirs from California, Oregon and the international community could be sampled. Winemakers were in abundance and eager to talk Pinot. The event was a joyous and convivial festival with Pinot geeks and enthusiastic wine lovers trading tasting tips, renewing their fraternal bond, and reveling in their good fortune. As it should be, this is not a venue for serious, extended wine tasting. There are however, notable Pinot Noirs that tickle your palate immediately, offering the aromatic sensuality, the dreamy flavor and seductive texture that is easy to recognize in Pinot Noir, but very difficult to describe. Admittedly, the best way to critically evaluate or even enjoy Pinot Noir is tasting it over time. As wine writer Eric Asimov, said several years ago, “Part of what makes Pinot Noir so exciting is it’s elusive nature. From one moment to the next, the aromas and flavors of a good Pinot Noir change in the glass, making it difficult to pin down.” That said, love at first sip is not unusual, and there are lasting impressions that can be gained by brief flings with a wine. Asuncion Ridge A 320-acre private hilltop ranch in Atascadero with a 7-acre estate vineyard planted to several Pinot Noir clones including HMR, Pommard, 2A, 23 and Dijon 115, 667 and 777. Phillip Krumel and partner Michael Dilsaver farm the vineyard and manage the inn on the property. Winemaker Krumel learned his winemaking craft from Marc Goldberg of Windward Vineyard. The wines are sold through a mailing list at www.asuncionridge.com or inquire at asuncionridge@hughes.net. I also tasted the 2006 Asuncion Ridge Pinot Noir which is more red-fruited and delicate, but equally enjoyable. 14.4% alc., $40. · Charming aromas of fully ripe black cherries, mixed dark berries and rose petals. Moderately intense in fruit flavor with nuances of cola and coffee bean, with a welcoming finesse and a silk and satin texture. Very good. Benziger Family Winery de Coelo The de Coelo (“day-chay-lo”) Sonoma Coast Pinot Noirs (Quintus Vineyard and Terra Neuma Vineyard bottlings) are sourced from the 25-acre biodynamically farmed de Coelo Estate property located on a rugged hilltop five miles from the Pacific Ocean. It is truly on the edge of where Pinot Noir will grow. I have been a fan of these wines and the 2009 vintage represents a truly stunning reflection of this unique terroir. The winemaker, Rodrigo Soto, has taken on this project with passion and conviction and the results are paying off. Learn more and acquire the wines at www.benziger.com. Not released. Fermented with native yeast. Aged in French oak barrels for 16 months. · Moderate reddish-purple color in the glass. Exotically spiced Pinot fruits on the nose with flavors of dark berries and cherry cobbler that are generous in intensity even at this young age. An acid-driven minerality lifts the fruit. A striking wine that makes an immediate impression. Very good (+). Bridlewood Estate Winery A 105-acre estate on the eastern edge of the Santa Ynez Valley offering a picturesque landscape including a Mission-style winery, hillside vineyards, and panoramic views of the surrounding region. Winemaker David Hopkins crafts a range of wines made from grapes sourced from many Central Coast vineyards stretching from Santa Barbara County to Monterey County. 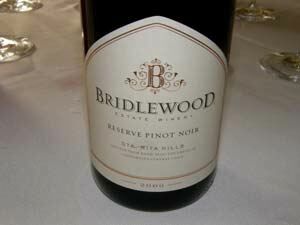 Visit the website at www.bridlewoodwinery.com. 14.3% alc., 459 cases, $50. Unreleased. Sourced from La Encantada Vineyard. · Bright aromas of fresh berries including blueberries which carry over on the medium-weighted flavors with impressive finishing persistence. Exceptional balance. Very good. Domaine Serene Ken and Grace Evenstad arrived in Oregon in 1989 and founded Domaine Serene in the Dundee Hills near Domaine Drouhin and White Rose Vineyard. The winery is one of the most modern and technologically advanced in North America. There are three vineyard estates totaling 150 planted acres planted exclusively to Pinot Noir and Chardonnay. The current winemaker is French-trained Eleni Papadakis who joined the winery upon Tony Rynders departure in 2009. Some wines are available online at www.domaineserene.com, with special bottlings reserved for mailing list and wine club members. The wines are expensive, but never disappoint. 13.9% alc., $58. A blend of Pommard, Dijon, and lesser amounts of Wädenswil clones sourced primarily from estate vineyards grown in the Dundee Hills (66%) and Eola Hills (34%). Aged 18 months in 67% new French oak barrels. · A pleasing wine with lovely aromas of savory red fruits, flavors of cherries, cranberries and oak accents, and a smooth finish with plenty of length. Drinking beautifully now. Good (+). Dragonette Cellars A partnership between brothers John and Steve Dragonette and close friend Brandon Sparks-Gillis. The trio spent many years learning the wine business through tasting, wine sales and winemaking under the tutelage of respected winemakers. To pursue their dream of making wine in the Santa Ynez Valley, they moved their families to the Valley to be close to the land and its bounty. The first release came with the 2005 vintage. The wines include Pinot Noir, a Rosé, Sauvignon Blanc and Syrah, and are sold through a mailing list at www.dragonettecellars.com. The 2009 Dragonette Cellars Sauvignon Blanc (14.3% alc., $48) was also sampled and was an intriguing barrel-fermented wine from Vogelzang Vineyard in the Happy Canyon region of Santa Ynez Valley displaying unusual tropical and peach flavors, brought to life with bracing acidity. 14.6% alc., 100 cases, $48. The Hilliard-Bruce Vineyard is located at the western edge of the Sta. Rita Hills AVA, one-half mile west of Clos Pepe, and is the first vineyard to be planted in the AVA with close spacing. Planting began in 2005. Clones are 115 and 777. 100% de-stemmed, 7-day cold soak, native and commercial yeast fermentation, aged for 15 months in 25% new French oak barrels, bottled unfined and unfiltered. · Darker cherry and berry fruit is nicely spiced and encased in grainy tannins giving a mouth feel with textural interest. A delicious, seductive wine that is surprisingly well-raised despite the young vines. This meticulously farmed vineyard is fast becoming a superstar in the region. Very good (+). 13.7% alc., 225 cases, $42. 45% La Encantada, 38% Kessler-Haak, 14% Cargasacchi-Jalama and 3% Fiddlestix vineyards. Average yield 1.8 tons per acre. 100% de-stemmed, 4 to 7 day cold soak, native and commercial yeast fermentation, aged 15 months in 33% new French oak barrels. · A well-assembled appellation wine that speaks of the region. A little savory, a little fruity with complimentary oak in the background, finishing long with intense black cherry and berry fruit and hi-tone acidity. Good (+). Evening Land Vineyards Evening land organically farms over 120 acres of heritage vineyards and produces 12 Estate wines. The vineyard sources include old vine own rooted Oregon and California heritage clones, cuttings from the great established Pinot Noir and Chardonnay vineyards of Burgundy, and an experimental block of Pinot Noir grown from seed. Wines are offered from the Sonoma Coast, the Santa Rita Hills, and the Willamette Valley of Oregon. Sashi Moorman crafts the wines from Sonoma and Santa Rita Hills, and Isabelle Meunier with consultant Dominique Lafon make the Oregon wines. For 2009, the early releases are three Blue Label Pinot Noirs (California, Oregon and Burgundy, all $75). In addition to the wine below, I tasted the 2008 Evening Land Occidental Vineyard Sonoma Coast Pinot Noir ($120) which was good, but not an exceptional wine. The wines are sold online at www.eveninglandvineyards.com. 13.5% alc., $60. · Moderate reddish-purple color in the glass. Shy nose offering more oak than fruit. Mouth coating fruit with incredible intensity on the palate persisting on the explosive finish. Fine-grain tannins enrobe the vivid dark cherry and berry fruit, with a noticeable oak underpinning. 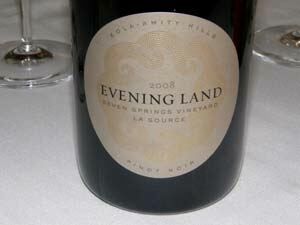 The Evening Land Pinots all have a significant oak imprint. Very good. 13.75% alc., $120. · Moderately light reddish-purple color in the glass. Shy fruit aromas with oak in the background. Savory and juicy cherry and berry fruit wrapped in supple tannins with a crisp finish. On the delicate side and approachable now, this is quintessential Oregon Pinot Noir that presently only hints at its full potential. Very good. 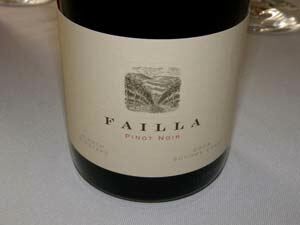 Failla Founded in 1998 as Failla Jordan, taking its name from the husband-and-wife team of winemaker Ehren Jordan and fellow debtor Anne-Marie Failla. The same year the estate vineyard was planted on the Sonoma Coast and together they began buying fruit for their first releases which were Rhone-style wines. After three vintages, legal issues over the use of the word Jordan (as in Jordan Winery) forced them to continue the label as simply Failla (“FAY-la”). Failla debuted in 2002 and is dedicated to sourcing cool climate fruit from coastal sites in California. Ehren crafted wine at both Neyers Vineyards and Turley Wine Cellars for many years before starting Failla. Chardonnay, Viognier, Pinot Noir and Syrah are offered primarily to mailing list members. Visit www.faillawines.com. 13.9% alc.. Unreleased. · Delicious and seductive, this beautifully crafted wine has the whole package of modest alcohol, bright and fresh berry aromas, discreetly concentrated dark berry flavors, bright acidity, well-proportioned tannic backbone, smooth mouth feel and lengthy aromatic intensity. Still very young, but possesses a very bright future. 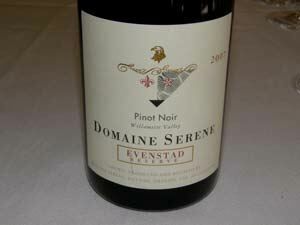 One of the best Pinot Noirs I tasted over the three days. Very good (+). Freeman Vineyard & Winery Ken and Akiko Freeman launched their winery in 2001. Devoted to Pinot Noir and Chardonnay, they have veered over time to sourcing grapes from cooler west Sonoma County vineyards and the wines have steadily improved as a result. Their talented winemaker, Ed Kurtzman, is assisted by Akiko, and associate winemaker Eric Buffington, and the trio craft wines that are approachable upon release, yet show enough balance and structure to allow for extended development in the cellar. Production is about 4,000 cases annually which is sold primarily through a mailing list at www.freemanwinery.com. 14.1% alc., $56. A blend of primarily cooler sites carefully chosen by Akiko Freeman, winemaker Ed Kurtzman and associate winemaker Eric Buffington. 41% Guidici, 29% Sexton, 12% Rayhill, 6% Thorn Ridge, 6% Bacigalupi and 6% Springhill vineyards. Aged 11 months in 41% new, 35% 1 year-old and 24% 2 year-old French oak barrels. · Moderate reddish-purple color in the glass. A cherry bombast on the nose with baking spices playing a supporting role. Elegant and seductive on the palate with a lengthy, crisp and aromatic finish. Very good (+). Gypsy Canyon Vineyards & Winery The Gypsy Canyon estate still has the original Mission vines planted over a 100 years ago by the first know woman wine grower in California, Dona Marcelina Felix Dominguez. Owner and winemaker Deborah Hall farms 12 acres of Pinot Noir, Pinot Gris and Mission. The Gypsy Canyon package gives a nod to California history with a hand-blown glass bottle of historically correct shape with an embossed glass seal, a handmade paper label, and a beeswax seal. Each bottle is numbered and signed by Hall. All this historical aesthetic adds to the appeal of the wine inside the bottle. 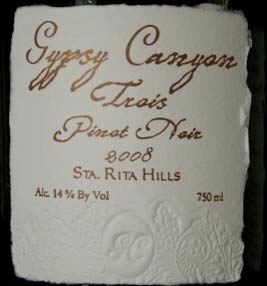 The wines are sold through a highly allocated mailing list at www.gypsycanyon.com. The wines are dear, but no expense is sparred in producing and packaging these unique artisan wines. 14% alc., $90. A blend of estate vineyard and a famous unnamed Sta. Rita Hills vineyard. · Lovely delicacy with hi-tone dark red fruit, sandalwood and spice box flavors with a hint of sinew. Minerally cherry on the nose carries over to the long, scented finish. Very good. Hirsch Vineyards The birthplace of great Pinot Noir on the Sonoma Coast. Planting began in 1980 and has continued through 2003 and currently consists of 69 acres of Pinot Noir and 2.5 acres of Chardonnay. The site is located at 1,500 feet three miles southwest of the Pacific Ocean. The current winemaker (since the 2007 vintage) is Ross Cobb and the vineyard manager is Everardo Robledo who has been at Hirsch Vineyards since 1988. The wines are available through a mailing list at www.hirschvineyards.com and retail distribution. 14.0% alc., pH 3.67, 1.642 cases, $60. Blended from 26 fermentation lots composed of fruit from 36 farming blocks and represents the totality of this site in this vintage. Aged 21 months in French oak barrels. · Very restrained aromatics. More giving on the palate with layers of interest including black cherry and cranberry fruit, cola, baking spices and a little sauvage. Still young and tight, it has the harmony to age for years. Very good (+). Hug Cellars Launched by Augie and Raquel Hug in 1994 with a mere 87 cases of Syrah made from grapes purchased from Alban Vineyards. John Alban became a valuable mentor for Augie and he made his wines at Alban Vineyards for nine years. In 2004, Augie moved to his own winery in Paso Robles. The first Hug Pinot Noir was crafted in 2001. Current production is about 1,700 cases, with about a third of that being Pinot Noir. The most notable Pinot Noir source is the renowned Rancho Ontiveros Vineyard. Hug Cellars wines are sold primarily through a mailing list at www.hugcellars.com and at the tasting room in Paso Robles. 13.7% alc., pH 3.25, 45 cases, $48. Clones 1A and 2A (Wädenswil). 100% whole cluster. Aged in 50% new French oak barrels. Unfined and unfiltered. · A superb wine that is just now coming into its own (it takes a few years for wines from Rancho Ontiveros to come around). Crazy amount of spice on the nose with a discreetly concentrated core of savory dark fruit and peppery spice on the palate, framed by bright acidity. Very good (+). Ken Brown Wines The founding winemaker at both Zaca Mesa Winery and Byron Winery, Ken Brown has been crafting wine in the Central Coast since 1977. He was one of the first to recognize the potential of Santa Barbara County to produce fine Pinot Noir and Chardonnay, and was the first to introduce Pinot Gris, Pinot Blanc and Syrah to the area. After leaving Byron Winery in 2003, he launched his own label specializing in small lot Chardonnay and Pinot Noir. 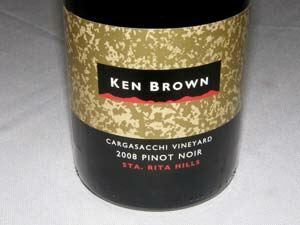 Ken Brown wines are sold online at www.kenbrownwines.com. 14.7% alc., pH 3.61, 137 cases, $50. From the 16-acre Cargassachi Vineyard planted in 1998 to clone 115. The vineyard is at the extreme west end of the Sta. Rita Hills AVA, making it one of the coolest vineyards in California. The Botella Series soils have a high calcareous content, allowing excellent drainage while limited yields. 100% de-stemmed. Aged 10 months in 43% new French oak barrels. · Deep, dark reddish-purple color in the glass. Packed with richly flavored dark Pinot fruits complimented by oak-contributed mocha notes, robed in supple tannins. Seductively smooth and velvety on the palate. The nose is still primal and the wine will become more nuanced with more age. This Pinot had several consumer fans at WOPN. Very good. Lachini Vineyards A boutique family run winery focusing on Pinot Noir. 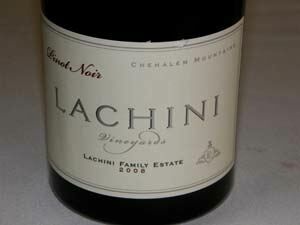 Lachini Vineyards began producing single-vineyard Pinot Noir from the 45-acre estate vineyard in 2001. The vineyard, which is situated in the Chehalem Mountains, is planted to a mix of clones including Pommard, Wädenswil, and Dijon. The winemaker is renowned talent Laurent Montalieu. The wines are sold through a mailing list at www.lachinivineyards.com. 13.8% alc., $45. · Moderate reddish-purple color in the glass. Restrained aromas of red and dark fruits with a noticeable oak driven coffee scent. Much more giving on the palate with a delicious medium weight array of layered dark Pinot fruits underlain with generous oak highlights and unresolved tannins. Despite its impressive concentration, there is admirable finesse carrying over to the silky smooth finish. Very good. MacPhail Family Wines Founded in 1998 by James MacPhail who learned his winemaking skills at Quivera, Pellegrini and Merry Edwards. 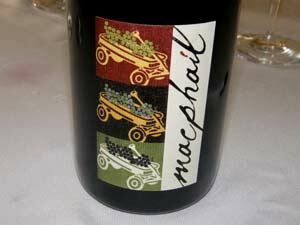 The Pinot Noirs are hand crafted in small lots at the MacPhail 5,000- case winery in Healdsburg. Grapes are sourced from various well-regarded vineyards in Sonoma County and Anderson Valley. The wines are sold primarily through a mailing list and online at www.macphailwines.com. Very innovative marketing at work here. 14.3% alc., 1,250 cases, $39. From Pratt, Gap’s Crown, Wildcat and Sangiacomo vineyards. Aged 11 months in 40% new French oak barrels. · Bright and fruity aromatics draw you in. Ripe, darker berry and cherry fruits are featured in this medium-weight wine with subtle oak highlights, finishing with respectable intensity of fruit, leaving a hint of heat in its wake. A fruit-driven style. Good. 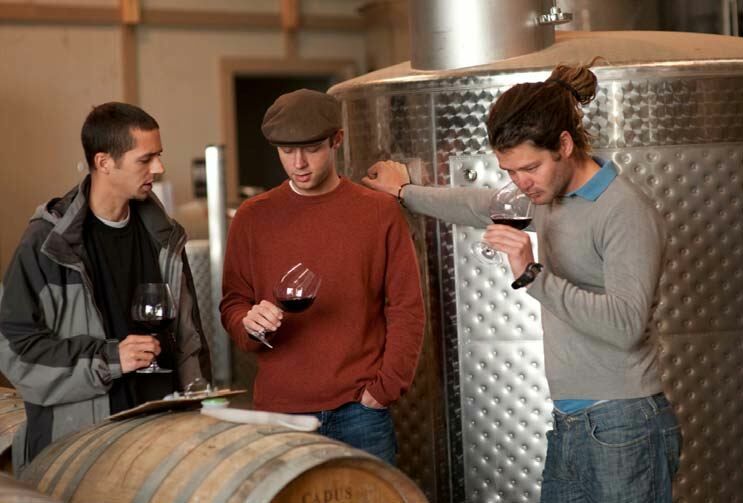 Masút Vineyard & Winery Ben and Jake Fetzer, sons of Bobby Fetzer, spent their childhood surrounded by their family’s 3,000 acres of certified organic vineyards in Mendocino County. At an early age they developed a great admiration for their family’s accomplishments and wanted to build upon their legacy. The Masút Vineyard & Winery was launched in 2009 with the assistance of the pair’s mother, focusing on estate grown Pinot Noir from their certified organic Masút Vineyard on a ranch in Redwood Valley. The winery is dedicated to Bobby Fetzer, who passed away in a river rafting accident in 2006. The Masút Vineyard is 23 hillside acres planted in 1997 to three Dijon clones (113, 115, 777). The site was chosen as a prime, but not conventional, location for Pinot Noir by Bobby Fetzer. The father and his sons cleared the land and planted the vineyard together. The name, Masút, means “dark, rich earth.” Visit the website at www.masut.com to acquire. 14.2% alc., pH 3.54, 700 cases, $40. Inaugural vintage. Aged 10 months in 55% new French oak barrels. · A stunning wine with alluring aromas of cherry pie and baking spices. Silky on the palate, with medium range flavors of red stone fruits wrapped in fine-grain tannins and bright acidity. Very approachable now. One of my favorites at WOPN. Very good (+). 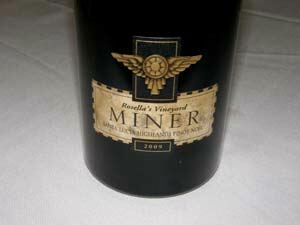 Miner Family Vineyards Located in the eastern hills of the Oakville appellation, and founded in 1998 by Dave and Emily Miner, this winery is not generally on the pinotphile’s radar as they are better known for Chardonnay and Cabernet Sauvignon. That said, they have been producing stellar wines for many years from Garys’ and Rosella’s vineyards in the Santa Lucia Highlands. The long tenured winemaker is Gary Brookman. The wines are available online at www.minerwines.com. 14.4% alc., 400 cases, $50. Aged 14 months in 75% new French oak. · Moderate reddish-purple color in the glass. The nose is nicely nuanced with scents of strawberries, raspberries, herbs and biscuit. Tastes of darker fruits on the palate with a complimentary note of cola and brown spice. Beautifully composed with supple tannins and good length on the aromatic finish. Very good. 13.7% alc., $42. 35% whole cluster, native yeast primary fermentation and native malolactic conversion. 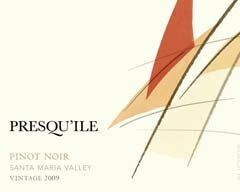 50% Presqu’ile Estate Vineyard and 50% Solomon Hills Vineyard. Clones 667, 115, Pommard and 777. Aged 14 months in 20% new French oak barrels. · Lithe and seductive, with immensely satisfying dark fruit array on a medium-bodied frame, displaying the signature Santa Maria spice, and ending on a juicy note. Very good. 13.4% alc.. 40% whole cluster. Native yeast fermentation and native malolactic conversion. Aged 14 months in 50% new French oak barrels. Clones 777 (75%) and 667 (25%). · An exciting wine displaying considerable charm considering its young vines origin. More intense, intriguing and complex than the Santa Maria Valley bottling, offering aromas of plum sauce, blackberries and spice, and a discreetly concentrated core of Dr. Pepper and dark berry jam flavors. Full of energy and light on its feet. Very good (+). RN Estate Vineyard Frenchman Roger Nicolas crafts Pinot Noir, red Rhone and Bordeaux varietals from purchased grapes in Paso Robles. The small production Pinot Noir from Fiddlestix Vineyard has been a favorite of mine over the last few vintages. Nicolas has a gifted touch with Pinot Noir, gathering his French sensibility with his years of experience in the restaurant industry to craft wines that seduce rather than attack. 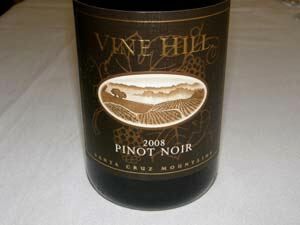 There is also a Chell Vineyard York Mountain Pinot Noir in 2008. The wines are sold online at www.rnestate.com. 14.7% alc., 170 cases, $49. Dijon clones 113, 115, 667. Aged 14 months in 45% new French oak barrels. · Lovely mix of dark red cherries and berries on the nose with toasty oak playing a supporting role. Soft in the mouth with moderately intense flavors offering welcoming charm. My only nit would be a touch of heat that peaks out. Good (+). Seagrape Wine Company Karen Steinwachs is a refugee from the high-tech world who learned her winemaking under Kathy Joseph at Fiddlehead and is now the winemaker for Buttonwood Farm Winery. Dave Robinson is also a techie who offers wineries logistics, warehousing, website and e-commerce solutions through Vintegrated Solutions. They are both big fans of Santa Barbara County wines. Together, they launched their own label, Seagrape Wine Company. The name comes from their island backgrounds. Dave came from the British Isles and Karen lived part of her life in St. Croix. They manage to always vacation somewhere in the tropics. The Seagrape tree is found near seaside beaches and is a visual reminder of both their winemaking roots and their love of the islands. The Pinot Noirs (Huber Vineyard and Hibbit’s Vineyard) and Chardonnay (Huber Vineyard) are sold through a mailing list at www.seagrapewinecompany.com. Karen is the incoming President of the World of Pinot Noir event. 14.5% alc., $32. Looking for something different? This wine was sourced from an unusual 2-acre vineyard located in the far western reaches of the Sta. Rita Hills AVA, owned and cared for by a walnut farmer. The climate is very cool and foggy and the vines are stressed by the weather and the wind. There are 13 clones of Pinot Noir inter-planted with Pinot Gris and Chardonnay. 100% de-stemmed, minimal new oak. · Moderate color and medium weight. A very savory expression of Pinot Noir with bright fruit, spice and herbs unencumbered by oak-driven influences. Admirable finesse and a snappy finish. Good (+). Sinor-LaVallee Spouses Mike Sinor and Cheri LaVallee founded Sinor-Lavellee in 1997. The pair met as students at Cal Poly San Luis Obispo in 1993 where they had “chemistry.” They were married in 1996 in Beaune, France, in the heart of Burgundy. Both have a colorful background in the wine industry. Mike made his name as the winemaker at Domaine Alfred Winery after several years at Byron Winery. His second label, Ancient Peaks, has been very popular. Total production is only 500 cases annually. The wines are sold primarily through a mailing list and online at www.sinorlavallee.com. The San Luis Obispo cuvée Pinot Noir ($29) is a very solid wine for daily drinking. 14.8% alc., $40. · This is not a wine for sissies: you have been forewarned. This vineyard offers big-boned darker fruit with flamboyant tannins. That said, winemaker Mike Sinor has managed to tame the beast, and the wine offers a big gulp of very ripe fruit with plenty of staying power on the finish. The wine is muscular but retains some welcoming charm and possesses an appealing soft mouth feel. Needs a big ribeye. Good. Vine Hill Winery A small, artisan winery in the Santa Cruz Mountains, surrounded by vineyard and redwoods with a panoramic view of Monterey Bay. The Vine Hill District of the Santa Cruz Mountains was formally established in 1867. The property has a long history of winegrowing. In 1968, David Bruce purchased the land and replaced the Zinfandel with Pinot Noir. In 1974, David Bruce sold the site to Ken Burnap who made distinctive wines for years under the Santa Cruz Mountains Vineyard label. The current Vine Hill team consists of winegrower Nick Guerrero, winemaker Sal Godinez and vineyard manager Rachel Ormes. The estate vineyard has received organic certification. Wines are produced under the Cumbre, Gatos Locos and Vine Hill labels. Beyond the estate vineyard, Pinot Noir is sourced from Nelson Family Vineyard and Devery Vineyard in the Santa Cruz Mountains. The wines are sold through the winery’s online store at www.vinehillwinery.com. 13.9% alc., $30. · Shy, but pleasant aromas of dark berries and exotic woods. Soft and smooth in the mouth, with a charming array of black cherry and boysenberry fruit, accented with flavors of cola and grilled mushrooms. Nicely crafted with admirable harmony, this wine goes down easy. Very good. 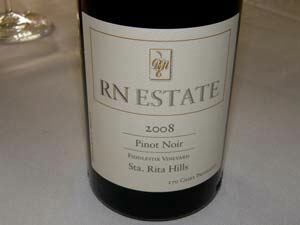 In January, I wrote about Paul Lato and reviewed the 2008 lineup of Pinot Noirs. On my way to World of Pinot Noir this year, I stopped by and visited Paul in his modest, but expanded winery space at Central Coast Wine Services in Santa Maria. We spent an afternoon sampling his 2009 lineup of Pinot Noir and Chardonnay. He opened up about his struggles through the years as a fiercely independent winemaker (Paul Lato Wines is truly a one-man operation and Paul has no investors), peppered with the many analogies he conjures that capture your attention (“I am fastidious about barrels, and treat them like a high-maintenance girlfriend”). Paul is an engaging personality and it easy to be seduced by cellar palate when tasting with him, but I believe I have enough integrity to honestly tell you that the 2009 Paul Lato Pinot Noirs are among the most sophisticated wines now being produced in California, displaying a stunning pinotosity in a Chambolle-inspired fashion. That is not to say that these wines are Burgundian, for they are clearly Californian, but they exhibit the same seductive elegance that wines from Chambolle Musigny offer. The 2009 wines were released to an eager mailing list this week and by the time you read this they may be sold out. The wines had only been in bottle two weeks, but were fresh and lovely. The moderately high alcohols are the result of the level of humidity in the winemaking facility which concentrates the wines, and not from picking grapes at exaggerated ripeness. Cold soaks are generally up to 7 to 8 days. No whole cluster is used except in the Syrahs. The wines are gently fined with egg whites (“A little makeup is a good thing on a pretty woman”) and bottled unfiltered. Paul only produces about 900 cases of Pinot Noir and Chardonnay (his 100 cases of Syrah are also outstanding but that’s another story). Sign up for the mailing list at www.paullatowines.com. Paul is also consulting now for Hilliard-Bruce wines and the Hilliard-Bruce Vineyard is a new vineyard-designate for Paul in 2009. These wines are crafted by John Hilliard, who puts his own distinct stamp on his estate Pinot Noir and are not stylistically identical to Paul’s. Visit www.hilliardbruce.com. 14.5% alc., pH 3.35, 200 cases, $55. Sourced from 6 acres of the choicest part of the vineyard. The vines are low-yielding Old Wente clone picked at 23.5º brix. Native and inoculated yeast. 100% barrel fermented, 100% malolactic conversion in 66% new Francois Freres and Damy French oak barrels. Gently fined and unfiltered. · Light yellow color in the glass. Expressive nose of Asian pears, green apples, and brioche. Crisp and bright flavors of pears and citrus fruits with subtle notes of biscuit and vanillin. Beautiful harmony and finesse. 14.2% alc., 100 cases, $60. Paul says it is crucial to know when to pick this vineyard and fortunately he has nine vintages of experience in managing his vineyard block. The grapes are from 21 year-old own-rooted Martini clone. Yields are 2 tons per acre. Aged in 50% new French oak barrels. · My notes say, “Amazing” twice, both in the aromatic and flavor descriptives. Alluring scent of fresh plums flush with spice. Red and black stone fruits with impressive presence and length on the finish. Just the right amount of oak spice influence to augment the fruit spice. No one does old vine Martini like Paul. 14.7% alc., 75 cases, $65. This vineyard is located near Melville on Hwy 246. Previously the vineyard was neglected, but the new owners have brought on Jeff Newton to bring it up to speed. The wine’s name reflects this, with Seabiscuit referring to the great horse that was initially mismanaged. 50% clone 113 and 50% clone 115 planted in shallow sandy soils. Picked at 24º brix. Aged in 50% new French oak barrels. · Lovely dark berry melange on the nose with a spice box high note. Luscious core of blackberry and black raspberry fruit with a vivid mineral lift and impressive persistence on the finish. Still has plenty of tannin on board that will integrate with time. Paul is just getting to know this vineyard, yet his inaugural take is distinctive. 14.8% alc., 200 cases, $65. Paul has sourced this vineyard since 2005 and has gradually upgraded his sections to obtain the best parcels. His vines are stunted and only yield a little over 1 ton per acre. Clones 115, 667 and a tiny amount of 777 (“777 is like garlic, you can only use a little”). Aged in 70% new French oak barrels. · Moderately dark color in the glass. Heavenly scent of fresh plums and blackberries echoed on the palate. Earthy and savory too, with plenty of Santa Maria spice. Smooth as a baby’s bottom with gossamer tannins. Hard to believe this wine is already so good to drink. 14.7% alc., 100 cases, $70. This vineyard is located on Hwy 246 4.5 miles west of Zotovich Vineyard and just west of Clos Pepe Vineyard. This is the first close-planted vineyard in the Sta. Rita Hills and is managed by noted Central Coast viticulturist Jeff Newton. Owner John Hilliard is fanatical about meticulous farming and this is one of the most manicured vineyards in California. The 21-acre vineyard was planted over three years beginning in 2005 to Dijon clones 115, 667, 777 and 828, Pommard clone, and Calera selection. This wine contains primarily clone 115 with a tiny amount of 667. Paul says the incoming grapes were perfect and didn’t require sorting (“Like a well-kept woman”). Aged in 50% new French oak barrels. · Demure aromatics showing darker well-spiced cherry, berry and currant fruits with an underpinning of forest floor and underbrush. Earthy and mysterious on the palate with firm ripe tannins, a silky mouth feel, and some persistence on the aromatic finish. A lot to like in this young vines offering. 14.7% alc., 125 cases, $70. This vineyard is farmed by Jeff Newton. Yields are 2.5 tons per acre from 11 to 12 year-old vines. Clones 115, 667 and 777. Aged in 70% new French oak barrels. · Gorgeous aromas of black cherries, blueberries, and black raspberries with a hint of cardamom spice. Powerful black cherry and red licorice flavors, but silky smooth with tamed tannins. I didn’t write much about this wine in my notebook because it defied descriptives and I was stunned as I sampled it. It was the only wine I swallowed. In a word, spectacular. Could be California’s next 100 point wine. 14.8% alc., 100 cases, $80. Sourced from 28 year-old own-rooted vines from the original block at Pisoni Vineyard. Aged in 80% new French oak barrels. From a less ripe vintage, requiring no manipulation. · Deep, dark reddish-purple color in the glass. Copious earth-kissed black fruits with a roseate note on the nose. A profusion of dark, plump black cherry and berry confiture with notes of game and cassis carrying over to an explosive finish with lasting intensity. Corralled tannins and very precocious. A bombshell and even better than the superb 2008. Paul has never been one to seek publicity but he has opened the door for me and I am happy to toot his horn. In his recent offering of the 2009 vintage he compared winemakers to accomplished musicians. He said, “Winemakers have so much to learn from music: about balance and harmonies, about rhythms and controlling the intensity of the expression. We must learn to make our wines a concert of flavors and textures, an experience that is fully pleasing and yet never too overwhelming. Music itself, especially classical music, is a tremendous tool (model) for us. It constantly reminds us about balance, harmony and elegance. Winemakers recognize how much music can teach us about the sensibility involved in making wine.” You see a window into the philosophy of Paul Lato in this quote. I, for one, am pleased that he has chosen to apply this analogy to his wines. *Lane Tanner, the Lady Gaga of Pinot Noir producers in California, is retiring. The 2009 vintage will be the last for the Pinot Czarzina. Lane launched her label, Lane Tanner Winery, in 1984, at a time when women winemakers in California were a rarity. She made the house wine for the Hitching Post restaurant for many years. She was known for crafting Pinot Noir with elegance and moderate alcohol and had a faithful following. Lane told me that she still has a good stock of library wines, including cases of magnums. Contact her through www.lanetanner.com. *George Bursick, who gained fame for the wines he crafted for many years at Ferraro-Carano, and who most recently transformed J Vineyards & Winery into an ultra-premium Pinot Noir producer, has chosen to strike out on his own as an independent winery consultant. 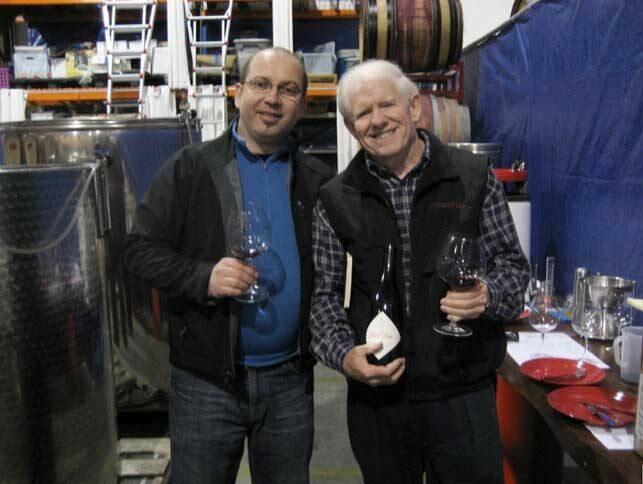 In addition, he is starting his own label, George Bursick Wines, which focuses on single-vineyard white wines. Visit www.bursickwineconsulting.com. He will remain a consultant for J Vineyards & Winery. *Buena Vista Winery has concluded its lease on its winery facility in Carneros. Ascentia is consolidating its production to it’s Geyser Peak facility in Geyrserville. Buena Vista will no longer be made exclusively from Carneros grapes, but will include fruit from throughout Sonoma County. Winemaker Jeff Stewart seemed saddened when we talked. He had put his heart and soul in the turn around at Buena Vista and the wines had become world class. Business is business, and the Buena Vista Winery under its current organization was not profitable. The Buena Vista tasting room will remain open to the public and the future plans for Buena Vista wines remain unclear, although reportedly they will become a “super-premium” brand. The future of talented winemaker Jeff Stewart is still up in the air. *Enthusiasm for Burgundy remains high as evidenced by the sold-out attendance at the Burgundian Seminar on Saturday morning. Moderator Allen Meadows (aka Burghound) was in top form and presented a captivating session on the history of Burgundy, using some excerpts from his new book, The Pearl of the Côte - The Great Wines of Vosne-Romanee. Young Turk winemakers Alexandrine Roy of Domaine Marc Roy and Thomas Bouley of Domaine Jean-Marc Bouley presented their 2007 and 2008 red Burgundies, primarily 1er Cru level wines. The wines of Roy come from Gevrey-Chambertain, and although the region’s wines are known for their rusticity and animale characters, Roy has put her own feminine stamp on the wines and they are very seductive and approachable, as well as offering good value. Bouley’s wines are more intense, but not lacking in charm and were superb. In 2007, the growing season was moderately warm, harvest was declared early, and the resultant wines are riper and more approachable early. 2008 was more challenging due to a very cool growing season. For those producers such as Bouley and Roy, who achieved phenolic ripeness and limited yields, the 2008 vintage produced fabulous wines, albeit with firm tannins and lively acidity that will take years to integrate. Allen feels that 2008 has transparency, showing individual terroirs, and enthusiasts should look to the reputation of the domaine in making purchasing decisions for that vintage. *There continues to be a cantankerous debate about high alcohol and balance with some claiming that no wine over 14.0% alcohol is balanced, and others willing to offer many examples of Pinot Noir with over 15.0% alcohol that are in balance. A Seminar at WOPN on alcohol and balance offered a panel of noted winemakers including Jim Clendenen (Au Bon Climat), Adam Tolmach (The Ojai Vineyard), Josh Jensen (Calera Wine Company), Adam Lee (Siduri Wines) and Michael Browne (Kosta Browne), but no definitive answers. I expected a more contentious panel discussion, but the specter of respect among the panelists prevented any such thing. The wines presented offered impressive drinking at low alcohols (2001 Au Bon Climat Mount Carmel Vineyard “Larmes de Grappe” Sta. Rita Hills - 13.2% alc. and 2006 Calera Mills Vineyard Mount Harlan - 13.5% alc.) and high alcohols (2008 Kosta Browne Keefer Ranch Russian River Valley - 14.7% alc. and 2008 Siduri Wines Keefer Vineyard Russian River Valley - 15.2% alc.). Moderator Eric Asimov summarized the discussion by saying that producers should not be criticized for the style of Pinot Noir they choose to make with consumers being the final arbitrators of style. Note: Siduri's Adam Lee presented two wines: 2008 Keefer Vineyard Pinot Noir (15.2%) and 2008 Cargassachi Vineyard Pinot Noir (13.6%). He switched the labels without telling the panel or audience. Rajat Parr (Wine Director for Michael Mina Restaurants), who was on the panel, asked Adam if he could buy a case of the "Cargassachi" Pinot Noir which was, in fact, the Keefer Vineyard Pinot Noir. Rajat has been an outspoken opponent of Pinot Noir above 14.0% alcohol, and features no wines on the RN74 (San Francisco) wine list that exceed this level of alcohol. Adam made a point, and although embarrassed, but to his credit, Rajat allowed Adam to announce this switch to the audience who were, of course, tickled. *We tend to think that all good Pinot Noir comes from either California, Oregon or Burgundy but the International Roundtable at the WOPN proved otherwise. There were some very impressive Pinot Noirs offered by producers from Switzerland (Moehr-Niggli), Austria (Weingut Johanneshof Reinisch), Germany (Weingut Dr. Heger), Chile (Kingston Family Vineyards), Australia (Yabby Lake), and New Zealand (Quartz Reef). The top wines from these countries are imported in minuscule amounts, but they are definitely worth a search.